Sundari is a cheerful host whose easy laugh will instantly make you feel at home in her in-laws converted home surrounded by fruit trees and filled with traditional art and decor. Sundari has been cooking since she was eight – she even cooked on her own coal stove as her mother prepared meals for her family. 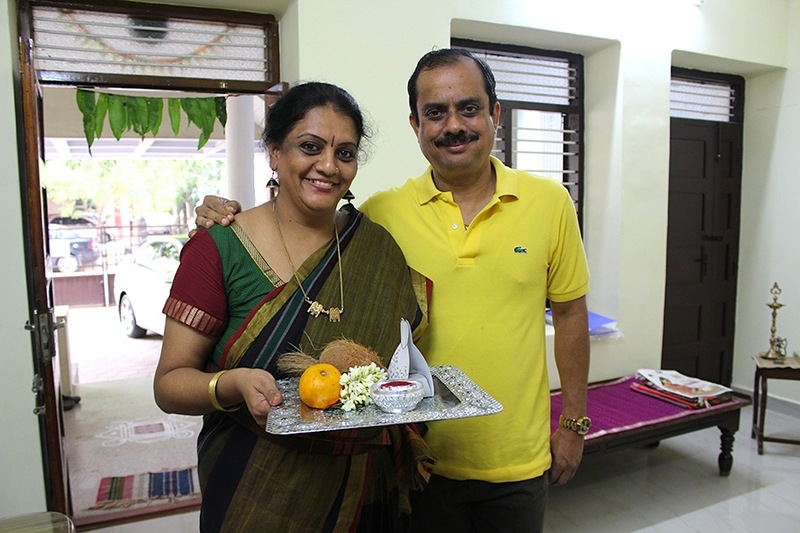 She delights in sharing her South Indian culinary and cultural traditions with guests. 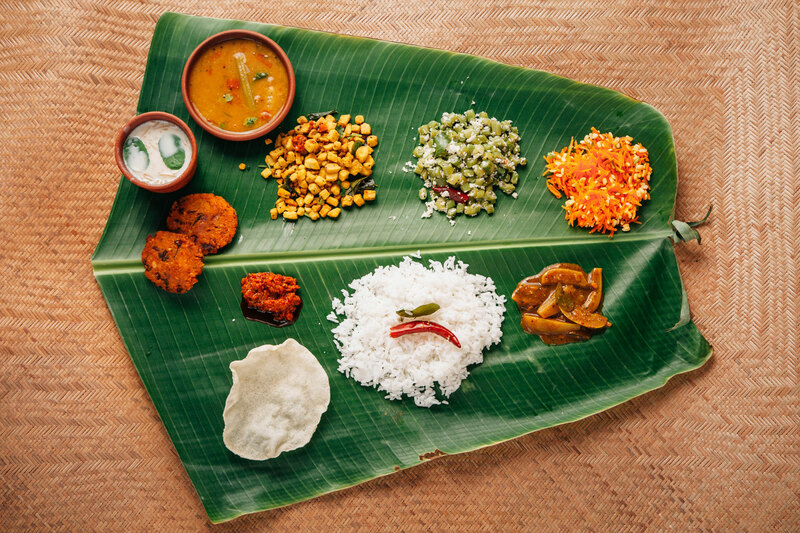 In-home meal: (1-8 guests) Enjoy a traditional South Indian vegetarian meal that you will eat with your hands on stainless steel plates or fresh banana leaves (if seasonally available). Flavors center around mustard, chilies, coconut, sour tamarind extract and native fruits and vegetables. Menu may include typical South Indian Tamilian dishes such as rasam (peppery soup of lentils and spices made with lemons, tomatoes or tamarind), sambar (lentil and tamarind based vegetable stew), kuzhambu (a tangy and spicy South Indian specialty flavored by sun-dried vegetables), vegetable curry, kootu (a special dish made of vegetables, lentils and coconut), rice, raita, appalams (also known as pappadams) and a spread of Indian condiments and snacks. Your meal concludes with South Indian filter coffee, a specialty coffee drink made by mixing frothed and boiled milk with the decoction obtained by brewing finely ground coffee powder in a traditional Indian filter. 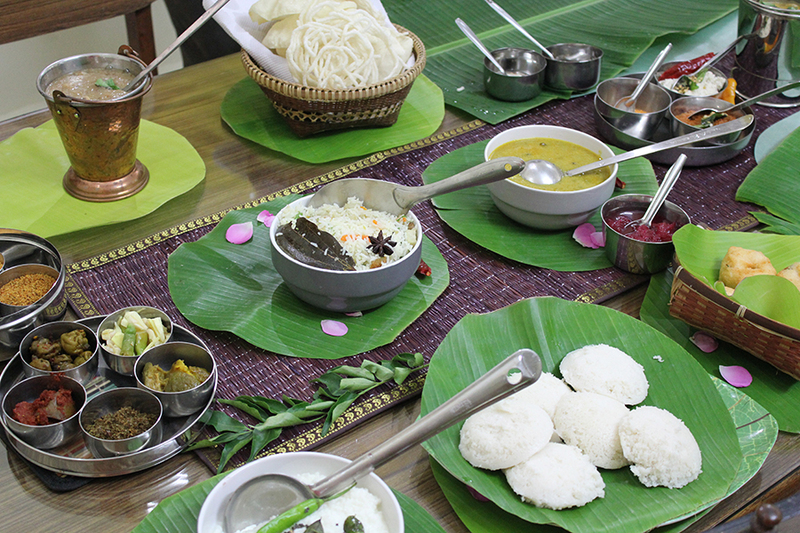 Cooking experience: (1-8 guests) Learn to cook 4-5 dishes, part of a South Indian vegetarian meal that you will eat with your hands on stainless steel plates or fresh banana leaves. 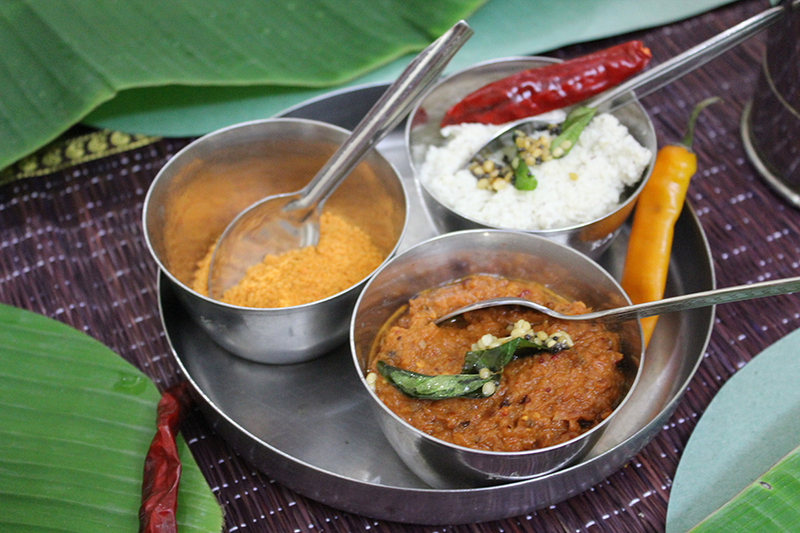 Menu may include typical Tamilian vegetarian main dishes such as rasam (tangy peppery broth), sambar (lentil and tamarind based vegetable stew), and a variety of vegetable curries, rice, raita, condiments and snacks. Alternatively you may request to learn to make a South Indian brunch of dosas, idlis and vadas with a variety of chutneys instead. 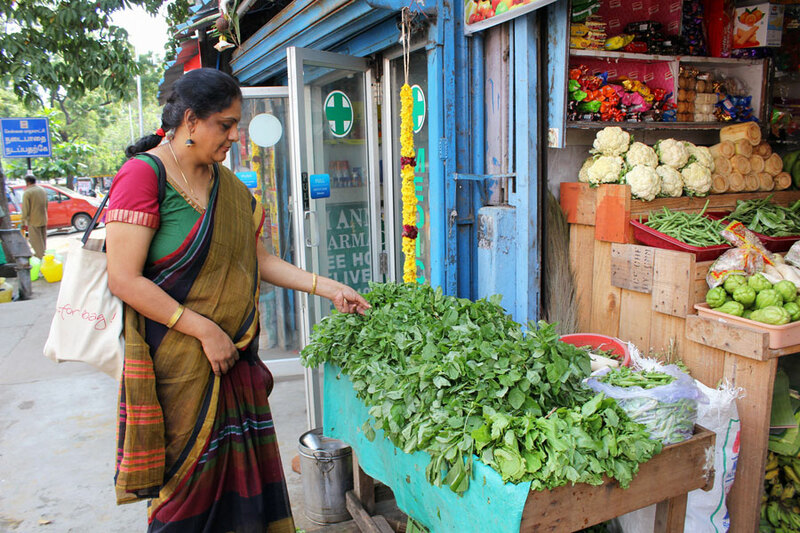 Market visit: (1-8 guests) You will start your experience with a tour of Sundari’s home and an overview of the food you will be cooking before embarking on your market visit. 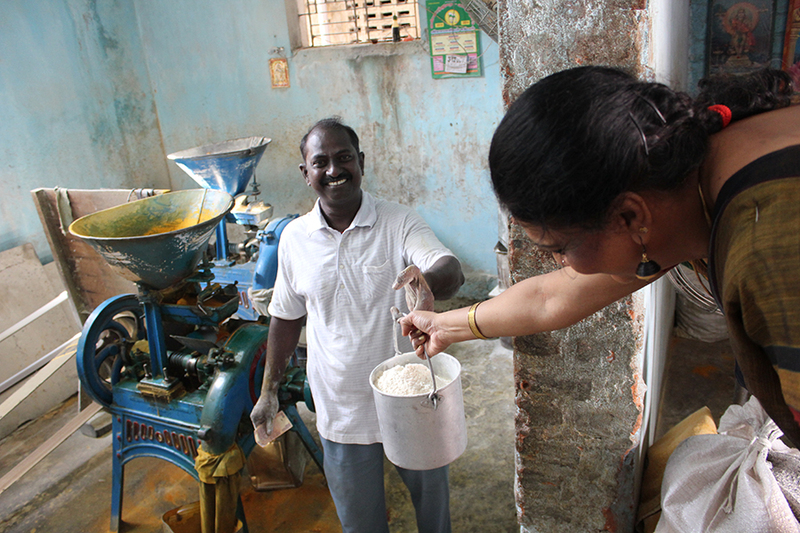 At the local Sastri Nagar neighborhood market you will watch as Sundari gets her wheat milled, see how coffee is ground and even visit the local temple. 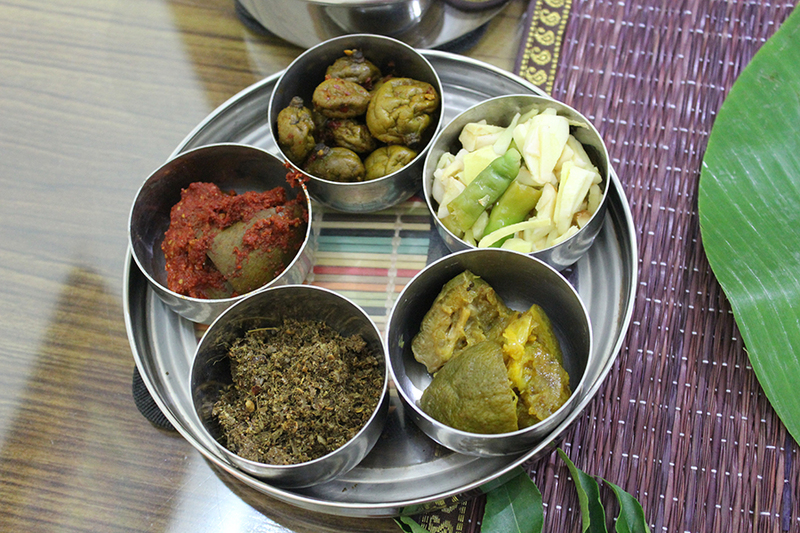 You will then walk back to Sundari’s kitchen and learn to prepare and share a South Indian vegetarian meal. 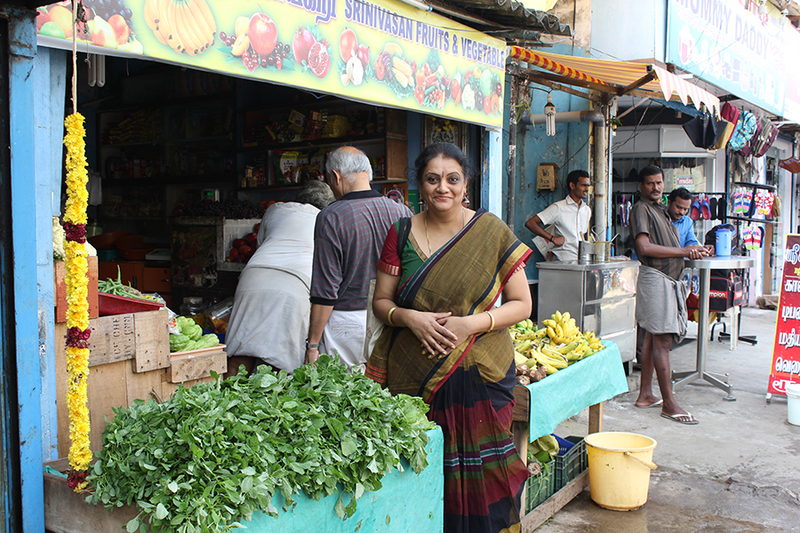 Please note that the neighborhood market in Chennai where Sundari does her shopping is a busy street with roadside stores and vendors. This is unlike an open bazaar/wet market with bags of fruits and spices you might typically expect. Notes: Sundari only serves vegetarian food as she is a Tamil Brahmin who only eats vegetarian. If you join Sundari for dinner or anytime on the weekend, her husband, Krishna, will join you. He is a foodie who loves meeting new people. Sundari only offers dinner experiences on weekdays (Mon - Fri) and lunch and dinner on weekends (Sat-Sun). Sundari and Krishna are such wonderful welcoming people. The activity was well organized - Sundari had asked us ahead of time (1-2 days before) about which recipes we wanted to learn. I had named several, and she kindly had made several dishes in addition to the three main ones. It was such a wonderful educational experience and the food was delicious. We had a traditional sit down lunch with so much food. She gave so many useful tips. We took our kids with us who had a wonderful time and they learned so much as well. We will definitely take lessons with Sundari next time we are in Chennai. Like being at home! Sundari was an amazing host. She opened up her house to me like I was a close friend and fed me till I could not eat anymore. She taught me so much and was so helpful in answering any questions I had and she was one of the kindest people I have ever met. Next time I'm in Chennai I'm stopping by again! Thank you Sundari it was an amazing experience! Excellent cooking experience! Brilliant cooking lesson and extremely welcoming host. Happily catered to our vegetarian, spicy food requirements and the food we cooked was excellent. Lots of recipes to practice at home and knowledge of which ingredients to use. Topped off by trip to the market to get more cooking accessories and ingredients. Best thing we did in Chennai! Sundari makes cooking South Indian food fun and exciting. She'll share with you tips that you won't get elsewhere and the best part is that you get to eat it all! If ever I am in Chennai again, I will come back and learn more things from her! Highly recommend spending the day with Sundari and getting an introduction to South Indian cuisine. Sundari is a great host and helped me understand the nuances of south Indian cooking and was very helpful and great to talk to. The walk around the market was also very interesting, especially the grocers where there was a variety of fruit and veg you don't see in Europe. I highly recommend a class with Sundari. Sundari and her husband are incredibly welcoming and accommodating hosts. We really enjoyed spending time in their home getting to know them and learning to cook South Indian dishes. 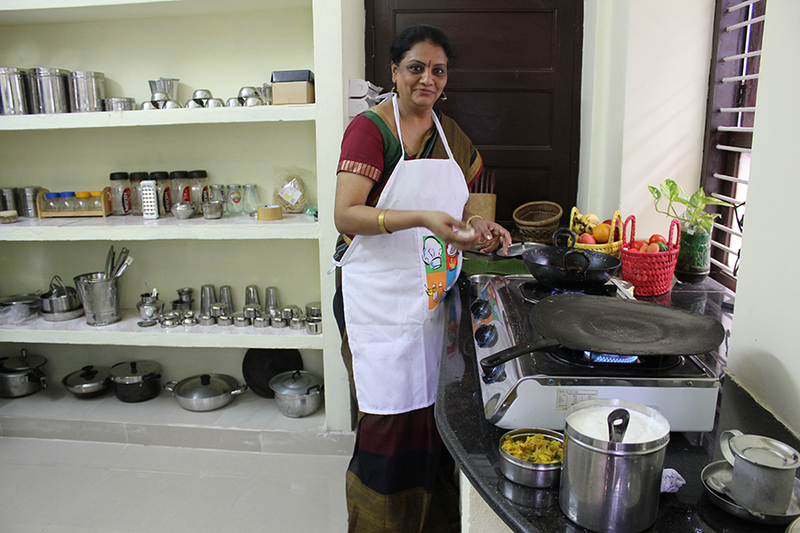 Sundari has an obvious passion for all kinds of cooking, and the food we/she prepared was absolutely delicious. Highly recommended for all visitors, and I would love to come back to learn to cook more dishes! Since I was traveling to Chennai on business, I did not have a lot of free time to explore the city. Having done cooking classes while on holiday in other countries, I knew this type of experience would be the best use of my limited time. If you are a person who enjoys learning about culture, eating great food, and meeting new people, Sundari does not disappoint! Both her and Krish welcomed me into their home and I felt immediately as ease in their presence. They went out of their way to ensure I was well taken care of. I encourage you to share a table with these two; best way to spend an afternoon in Chennai. Sundari was amazing! This was a fantastic way to learn about and get in touch with local culture. It's so difficult as a traveler to meet with and interact with real people who live in the cities we visit, but this was a great way to bridge that. I've recommended it to all my friends who might visit South India soon. Sundari was such a gracious and friendly host and her joy of sharing her own cuisine and culture was readily apparent. I felt so comfortable around her immediately -- she was a great teacher and host. I had an excellent day with Sundari and her husband Krishna. They were loving, warm and welcoming. They shared with me their passion for their city and how that can be expressed in food. What a treat! The food was delicious and Sundari's warm and welcoming approach made for a calm and pleasurable day. It was a beautiful day with beautiful people! Sundari is warm and welcoming host that makes you feel like part of her family. The house is filled with happiness as she is this happy soul that touches your heart. I love her open nature, spirit that made it really far more than a cooking class. She is passionate and loves what she is doing. Beforehand Sundari asked me what I would like to cook, but I trusted her choice and the 3 recipes she showed me were excellent and I can't wait to cook them. In a cozy atmosphere I learned a lot about traditions, beliefs, culture, food while enjoying a delicious home cooked dinner together. We also went together to some local shops where i could buy some of the ingredients to cook some dishes back home. The experience touched my heart and i will remember always. Amazing Southern Indian Culture & Cooking Class with a Delicious Meal While in Southern India for my son's wedding, I was so excited to learn about Traveling Spoon and the incomparable opportunity to indulge in an authentic Southern Indian cooking lesson and home cooked meal. Upon arrival at her home, Sundari greeted us with sincere warmth and hospitality. 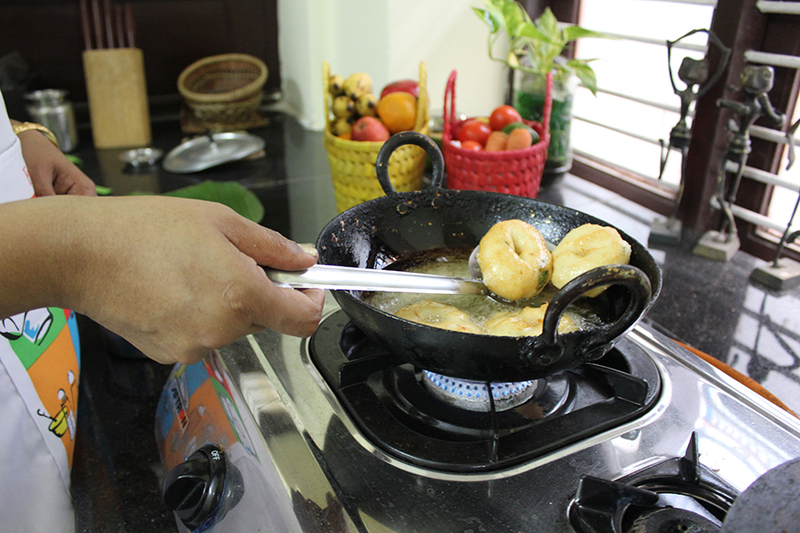 What a treat to learn how to cook genuine Indian dishes in the kitchen of a local citizen. Sundari speaks perfect English which allowed us to relax and truly enjoy the experience. 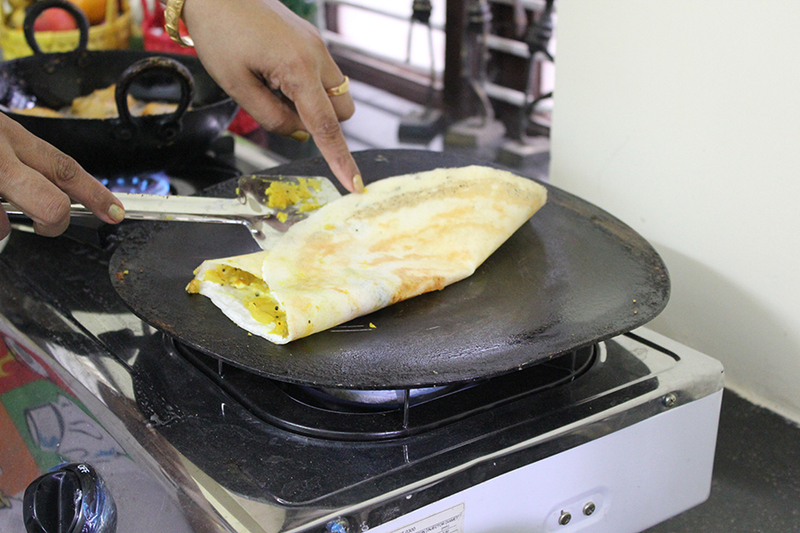 I fell in love with dosas and had a blast trying to learn to fry them just right. Eating gluten free was much easier than I expected. To have a local professional teach us how to cook and then invite us to dine at her table as we relish the favors and smells, is a totally unique and once in a life time experience. To top it off, Sundari prepared us for the upcoming wedding by showing and describing what we could expect at a Hindu wedding ceremony. It was great to hear her personal experiences of the wedding ceremonies multiple day celebration. Sundari's home is conveniently located near hotels which made it so easy to get there and back. I wholehearted encourage anyone visiting Chennai to schedule time to visit, learn and eat an exquisite meal from the gracious Sundari! 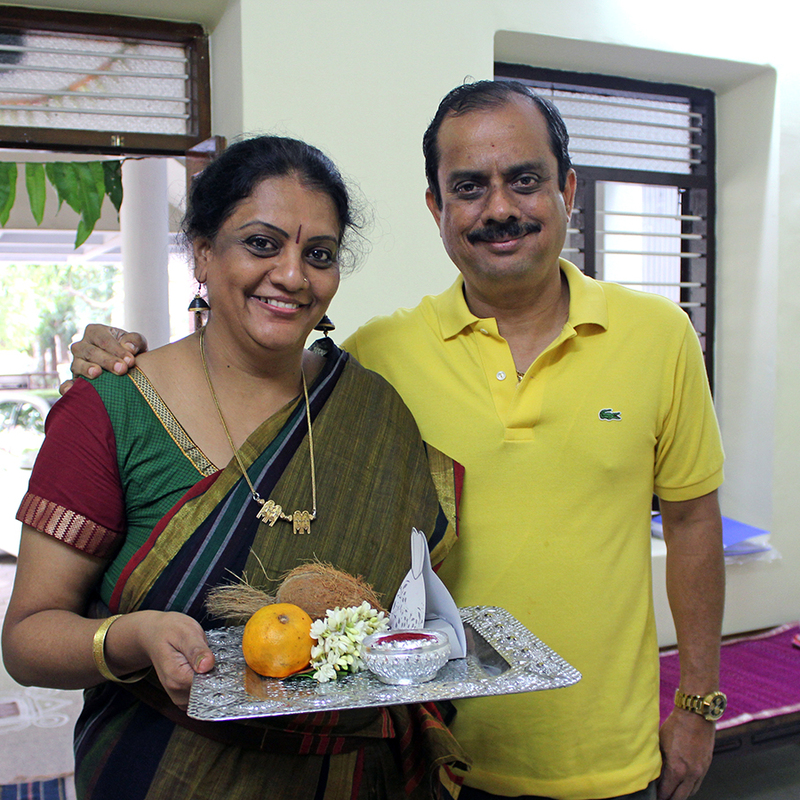 Sundari and her husband are extremely welcoming and a joy to be around! It was great to talk to them about their lives and what it is like living in Chennai as well as cook together. Sundari is very passionate about her work which is shown by her wonderful smile and enthusiasm. She does a fabulous job of putting together the entire day on her own - wonderful welcome drinks, coffee, cooking together and then a nice market visit and back to finish up the cooking and best part... eat. We enjoyed the best meal we have had in India! The food is fantastic and the presentation is very appeasing! I am very excited to try cooking the dishes we made when we are back in the states. Thank you Sundari for the wonderful experience. I look forward to keeping in touch! This was a wonderful experience. Sundari was a fantastic host and teacher, and all aspects of the day exceeded my expectations. The food was delicious and I left feeling confident that I can cook these dishes at home. In addition to the food and cooking, Sundari shared aspects of her culture, and took me to local places of interest that helped to shape the overall experience. If you are considering this experience, take the chance! I can't recommend it highly enough! Efficient and well-organized and great hospitality; and just a fantastic experience! I have done many cooking classes in India and in other countries, but this is by far, the best class I have ever done. Not only I learned new ways and recipes to cook, but I also learned invaluable insights into the culture and customs of India from Sundari. Her sincerity and hospitality made the experience unforgettable. Her husband was also a great host - very friendly and open. They truly welcomed me into their home and their hearts. Thank you very much. Sundari's expertise in guiding us through the preparation of the cuisine of South India was beautifully balanced by her gift of storytelling. Her grace and charm had us at ease instantly and she made what we thought was complex in the preparation of the meal easily understood and it was absolutely delicious. We left with a greater knowledge of the culture through the welcome blessing, and the additional tour of her local area. Her attention to detail is exceptional. Plus we had the chance to meet her husband Krishna -such interesting conversation, we felt we left with two new friends. For each dish we were encouraged to taste and make suggestions if it was ready, this made us feel we were truly making the dishes ourselves. Sundari has a gift for cooking and for making people feel at ease. Sundari not only let us experience cooking in her wonderful kitchen, she gave us so much information about her city, her customs, traditional home life, and family. We were there during Diwali so she included us in some of the wonderful celebrations for that festival. We also got to walk around her neighborhood meeting her market friends, like her tailor, etc. and visited her temple. It was exactly what we had hoped for and more. She was gracious, kind, has a great sense of humor and made us feel like friends, not just "clients." The food was amazing, and the time spent was well worth it! My favorite dish...It was all so good. Biryani was a big hit, as was the curd rice, the dosas, and learning to make the filtered coffee. What a memorable evening! The experience was beyond my imagination! I entered the house thinking that I'll learn some basics of how to cook Tamil Brahmin cuisine. The experience turned out to be much beyond that. Sundari and Krishna greeted me with genuine smile when I first met them, and gave me a tour of their beautiful home before we started getting things started (they even made a personalized welcome-sign on the chalk board in their kitchen). Cooking with them almost made me feel like I was cooking with my own family members in my home kitchen, rather than attending a cooking class. Sundari is a very patient and fun chef, who can share the background of the ingredients and the dish itself. We also went to explore the local marketplace and bonded over homemade filter coffee (traditional coffee of Southern India). If you want a complete immersion to the local culture, great Tamil Brahmin vegetarian food, & great company, I strongly encourage you to visit Sundari's kitchen. You step in their home as a guest through Traveling Spoon, but you step out as a part of their family. Thanks Sundari & Krishna! Sundari and Krishna were amazing hosts! They really went above and beyond our expectations. We learned a lot about local culture that we wouldn't have otherwise (wedding customs, clothing, and of course, the ingredients themselves), and her food was the best we had during our week spent in India. If I lived in Chennai, I'd want them to adopt me. I've already recommended them to friends who had a great experience as well. Thanks Sundari and Krishna! Sundari is a super hospitable host. She welcomed me and my friends at the entrance of her house with her husband and treated us like daughters. They showed us the traditional Indian custom and let us experience them. Surprisingly, she had prepared so many kinds of recipes for the lesson other than those we had ordered beforehand. She showed us how to cook those dishes efficiently and skillfully with humor. And after that, she took us to a local market and showed us unique vegetable and fruits, good coffee and spices. And eventually, we really enjoyed talking and having those many dishes that we cook together. Everything looked great and was amazingly delicious! I think everyone not only vegetarian but also non-vegetarian can get satisfaction from her cooking lesson and hospitality. Sundari was wonderful, sharing her South Indian culture with us before we even stepped inside. We felt so welcomed, it was as if visiting family! Her home is lovely, and we were allowed to take part in some wonderful traditions, in addition to the meal. Sundari was very well organized and clear with the instructions. I loved how many of the ingredients were from her own garden! This was the best experience my friend and I had since coming to India, and the most authentic. I look forward to trying out these recipes at home and hopefully come back to visit!